There is good, solid information in the first 8 chapters of the book. It's easy to read and absorb. Applying the ideas as a habit will take some effort on your own. Pretty much all the stuff after chapter 8 is just fluff. It would even be too generous of a compliment to say that the remainder of the book is peripherally related to brevity. The stories that go on and on and on. Disclaimer: These are primarily written for my own future reference, but they may be useful to you, either to decide if you want to read / buy the book or as something to revisit. The information is not comprehensive, not in the least - so, please don't use it as a substitute for actually reading the book. As with all my content, some is verbatim from the original source, opinion may be interspersed & of course, YMMV. Being brief is not just about time. What's more important is how long it feels to the audience. It's not about using the least amount of time. It's about making the most of the time you have. It's a balancing act of being concise, clear, and compelling. All three need to be in harmony. 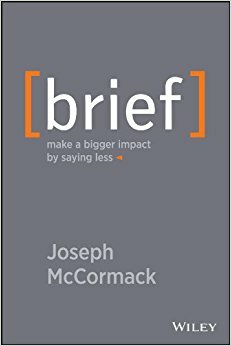 To be brief doesn't just mean being concise. Your responsibility is to balance how long it takes to convey a message well enough to cause a person to act on it. That's the harmony of brevity when it's striking the right chords. Brevity starts with deep expertise. Only with thorough knowledge can you accurately make a summary. The road to brevity hard work and lots of time. Doing all the digging and analysis on your own time saves the members of your audience from doing the labor themselves. Your leadership team doesn't know what to do with your assessment & guidance & subconsciously starts questioning your leadership ability... When someone who is braver & clearer steps up, you're history. Nobody likes to talk to you because once you start, there is little they can do to stop you... People ignore or instantly delete your e-mails. Over the course of your career, your specialty knowledge & knack for being long-winded impede your career growth. If people see that you don't respect their time, they'll stop respecting you. During your review, you get low scores from your peers. There's a time & place for small talk. You must always be aware that what is exciting for you to share could be agony for someone else. You should treat everyone the same way; they are busy & begging you to be brief. Even though your idea is still developing & in lots of pieces, people will make judgments about you & your abilities. Choose carefully when & where—& to whom—you think out loud. When people want a simple answer, you need to give it to them... (else) they lose patience & trust. Being mentally & verbally lazy sends a clear message: you might not be ready for the next assignment—or even be the right person for the job. Think of a defining professional moment. Take 10-15 minutes to prepare for a 3-minute presentation. Present to a partner who listens, takes notes, and shares a 1-minute version to the rest of the group. When telling a story, Level 1 details are those that are absolutely essential; Level 2 points are those that add a little flavor but do not take too much more time; Level 3 items weigh it down and don't make the story noticeably better. This challenge forces you to start trimming. To hit the 1-minute mark means only Level 1 and a few Level 2 details. Ensure instant appreciation: People are thankful when it requires less energy to grasp the same basic information in less time. Look for what weighs you down: Cutting out the finer detail requires attention and awareness for what unnecessarily burdens people. Live the "less is more" way: When you are throwing things out, it may be hard to decide what goes - but keep in mind what people will really care about. Outlines organize and prioritize thoughts with clarity and logic, and help stop nonsensical rambling. Prepared: I'm ready to deliver. Organized: I understand how all my ideas connect. Clear: I'm certain what my point is. Contextual: I can draw a bigger picture so my point stands out. Confident: I know what to say, inside and out. Mind mapping software is particularly well suited to information triage, because it enables you to gather, organize, evaluate, and take action on a vast amount of information, knowledge, and ideas…by giving you the power to move topics and subtopics around, attach notes, links, and documents to them that provide meaning and context, and play “what if” with your ideas. No other type of software provides the power and flexibility offered by mind mapping software for manipulating information and ideas. Do not use your turn to start an irrelevant conversation. Know when to end so the other person can begin talking again. Highly recommended. An excellent Kanban resource. Recommended, but be ready to filter out some strange anecdotes and slightly whacky techniques. Recommended, but only chapters 1-4. Recommended: In-depth treatment, good writing style makes it easy to absorb information. YMMV (Your Mileage May Vary). The book is primarily for executives & decision makers. Recommended. Well worth the time. Watch the 18 min TED Talk instead - there, I saved you 5 hours. Python violates 'The Priciple of Least Astonishment' when using a mutable default value as a function parameter.